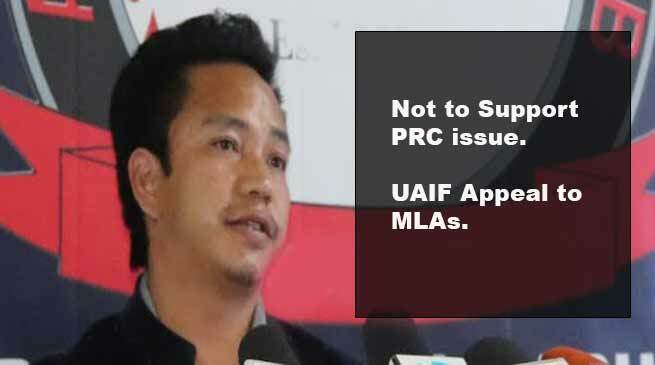 UAIF appeal to the all MLAs of Arunachal, not support the issue of PRC in coming budget session of Arunachal Legislative Assembly. The United Arunachal Indigenous forum (UAIF) today appeal the JHPC to submit the report on PRC keeping view the sentiment of the indigenous people of state, the organisation also appeal all MLA of state not to support the issue in the State Assembly if it is brought for discussion in Assembly during this budget session. Addressing a press conference UAIF President, Laffa Paffa informed that “UAIF would be carrying out a mass bike rally on February 10 from Nikum Niya hall to IG Park, Itanagar as a part of its ongoing movement against proposed decision to grant Permanent Resident Certificates (PRC) to few non-tribal populace of Lekang constituency”. Refuting the ground on which Non-APST inhabitants are claiming PRC, he asked them to furnish a copy of their lineage of their existence in that particular are before enacting of the said BEFR before media and state government to examine whether their claims are truly genuine. The forum further strongly opposed the Citizenship Amendment Bill 2016 which seeks to grant citizenship to Hindu minorities from neighbouring countries. At a time when our state is facing threat from Chakma Hajong Issue, Paffa alleged that they are appalled with the silence of the state government over the controversial bill. The forum reiterated that ‘they would go to any extent if announcement to grant PRC is not revoked within the stipulated time or issued rather they appeal to cancelled few PRC which were issued earlier.